Let’s Go Japanese At Matsu, Batu Ferringhi Penang! 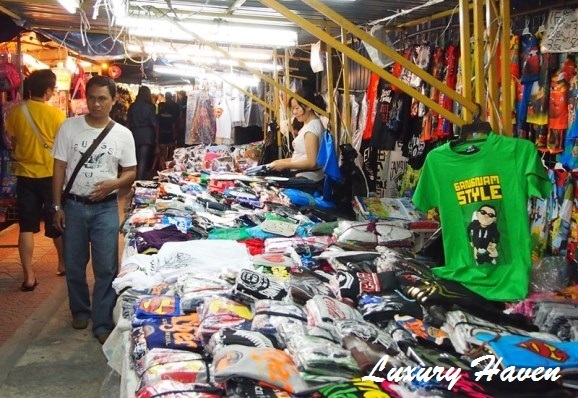 You are here:Home » Travel » Let’s Go Japanese At Matsu, Batu Ferringhi Penang! Celebrating the laid-back vibe of Japanese dining is Matsu (松), the only Japanese restaurant on the tourist strip of Batu Ferringhi! 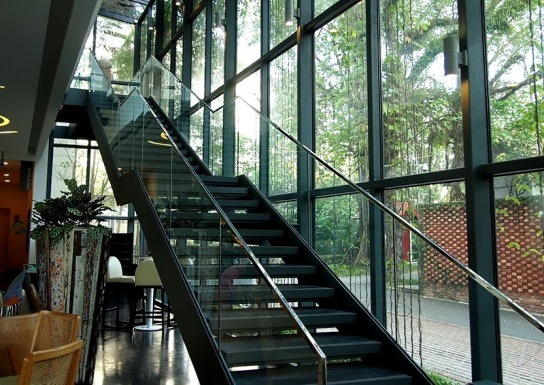 Up the stately staircase above Batubar, Lone Pine’s chic bar lounge, is Matsu. 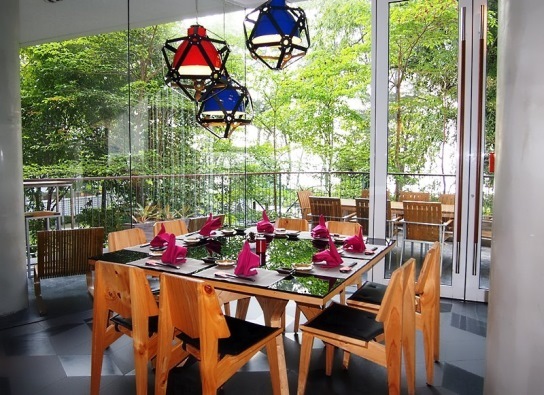 Casual with a distinct Japanese twist, the fusion restaurant can comfortably sit up to 60 pax with the option to dine on the balcony facing the Straits of Malacca or inside the beautifully decorated restaurant that that has pine wood finishing for its furniture to wall panelling. Thanks to the good people of Lone Pine Hotel Penang, a sumptuous feast was in place for the 3 hungry souls after our soak in their Infinity Salt Water Pool. 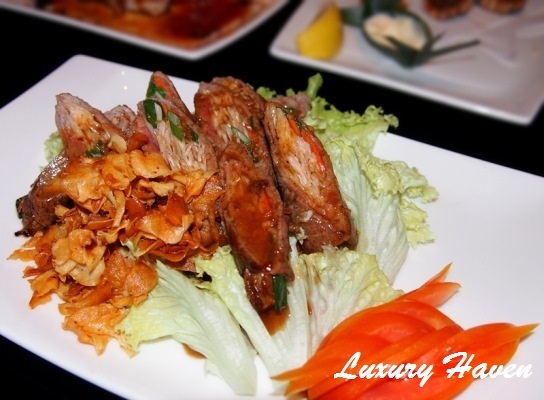 Honestly, we didn’t think much of Matsu when the appetizer made its appearance. We certainly didn’t expect to see crabsticks. However, what soon followed changed our mind & we were swayed by their bewildering array of mouth-watering plates that were dished out one after another……. 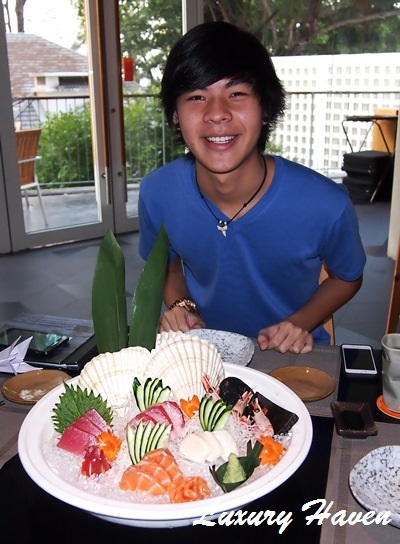 My family was first tempted by a gleaming showcase of succulent sashimi. 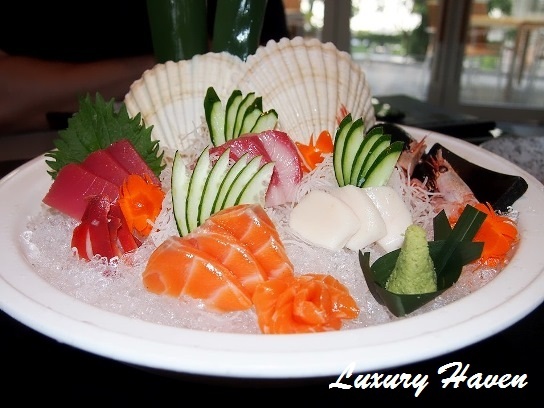 The Sashimi Moriawase (刺身盛合せ) @ RM160 was a Chef’s selection of 5 different kinds of imported raw fish. Alluring presentation, isn’t it? 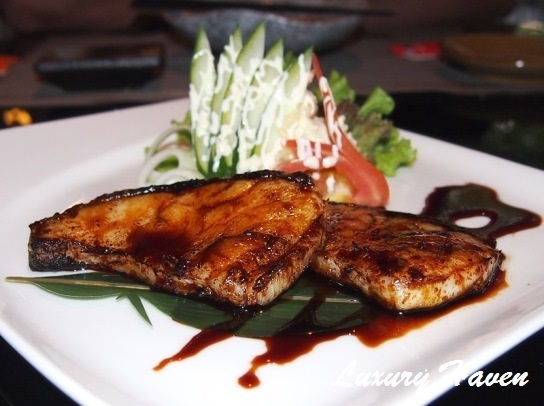 The Gindara Teriyaki (銀鱈照り焼き) ＠ RM39, was fragrantly grilled & fully flavoured with the tasty Teriyaki sauce. We gobbled up the mouth-watering cod fish in no time. The Grilled Pregnant Fish (子持ちししゃも) @ RM15 was requested by our dear son. This is the only dish he was craving for that evening. When asked why I wasn’t eating, my answer was simple – I don’t wanna get pregnant again! Lol! Have you seen Calamari done this way? 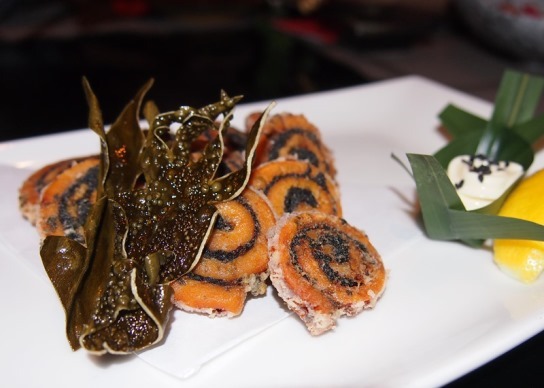 The Ika Naruto Age (いか鳴門揚げ) @ RM28 was creatively rolled with seaweed & deep-fried to a golden-brown. 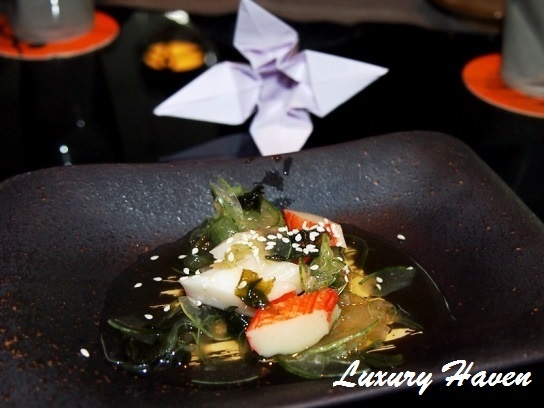 Dishes at Matsu were crafted with meticulous attention to every detail & beautifully presented at your table. Ebi Shioyaki (えび塩焼き) @ RM16. 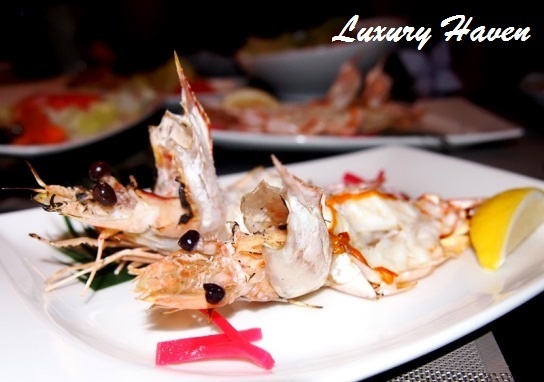 I'd expected more flavours from this Grilled Prawns with salt, but it turned out to be very ordinary. Offering uncompromising Japanese dining, the Teppanyaki Beef Enoki Roll (えのき牛肉巻き) @ RM42 with flakes of crispy garlic was another delightful dish. We chomped at the beef rolls greedily as though we’d been starved for many days. Wagyu of the Day (和牛照り焼き/たたき/鉄板焼) @ RM110. 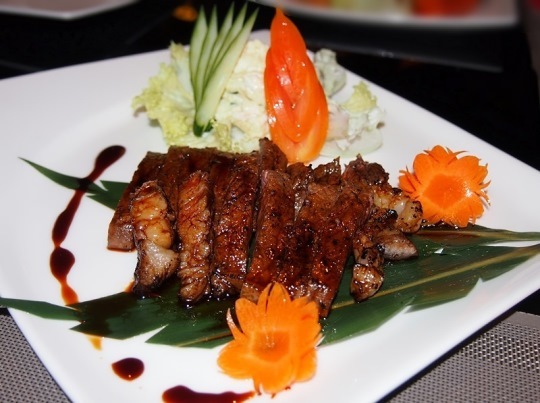 For this Australian Beef, diners get a choice of preparation – Teriyaki, Tataki or Teppanyaki style. We had the recommended Teriyaki & found the sauce to be too generous. I love Wagyu, but sadly, the Australian ones are a far cry from the Japanese Wagyu. Though tender, it didn’t have the melt-in-your-mouth effect & the sauce was just too sweet. Then again, RM110 is a bargain for the plate of Wagyu. 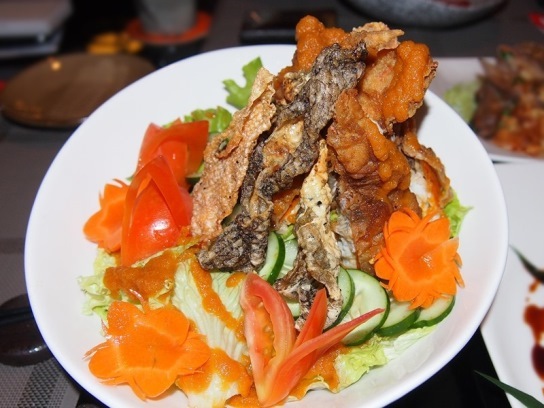 Salmon Skin & Soft Shell Crab Salad (サーモンスキンとソフトシェルサラダ) @ RM28. The refreshing salad perked us up with its medley of vibrant colours. As though the above elaborated menu wasn’t enough, the generous Matsu rolled out some of their newly created dishes (prices not available at the time of tasting), & my family were the first to try! How cool is that? A must-try is their Tuna Tataki (まぐろのたたき). The slices of Maguro were glazed with black pepper & drenched in red peppercorns, which reminded me of Szechuan dishes. There was a sharp distinctive taste & slightly numbing note on the palate due to the peppercorns. 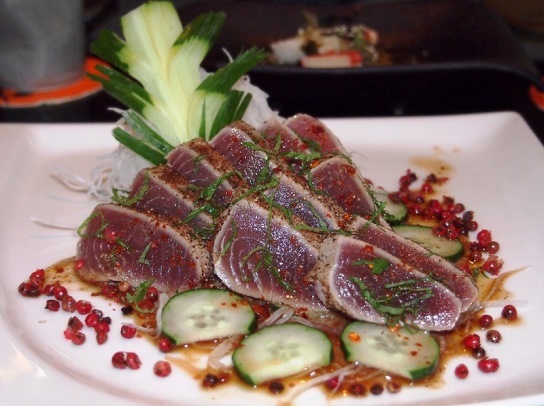 A perfect twist with a sourish tinge to the popular Japanese Tataki starter! Try popping some of the peppercorns to add some crunch to the silken texture. 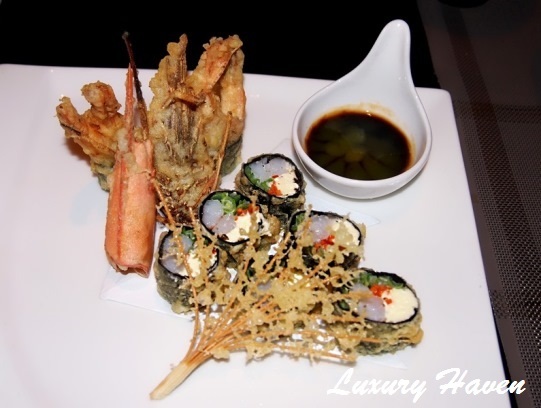 Sink your teeth into these Ebi Sushi Tempura Rolls. Semi-cooked prawns were wrapped into sushi rolls with cream cheese, accompanied by a sweet sauce with a hint of mango purée. A clever rendition breaking away from the traditional makizushi. Besides their roasted Japanese tea, the considerate host also offered us Miso Shiru (味噌汁) @ RM10 each to add on to our meal. I nibbled at the Hotate Ishiyaki　(帆立石焼), relishing every bite of it. The Canadian premium scallops were lying on a bed of crunchy shredded potato on hot stone. 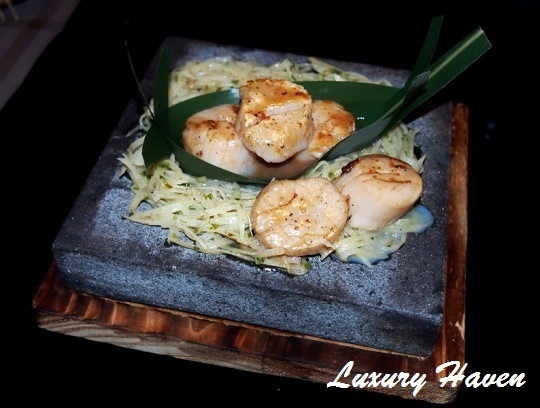 Love everything from the teppanyaki sauce, the peppery taste, the yummy potatoes, & fresh plumpy succulent scallops! 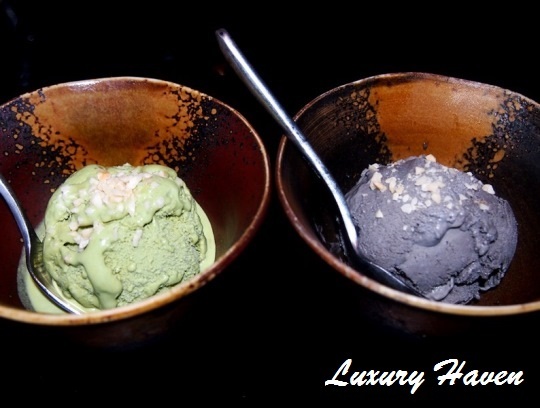 Don’t forget to end off your meal with their Matcha & Kurogoma Ice Cream (抹茶・黒胡麻アイスクリーム) @ RM12 each. If that’s not enough, try their Matcha Tiramisu (抹茶ティラミス) @ RM18. 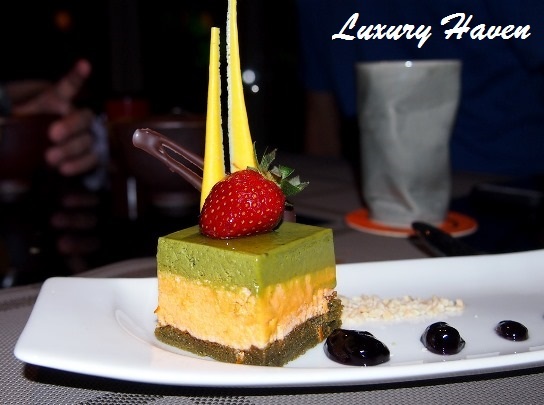 The tiramisu at Matsu has a different interpretation with a delightful orange twist. 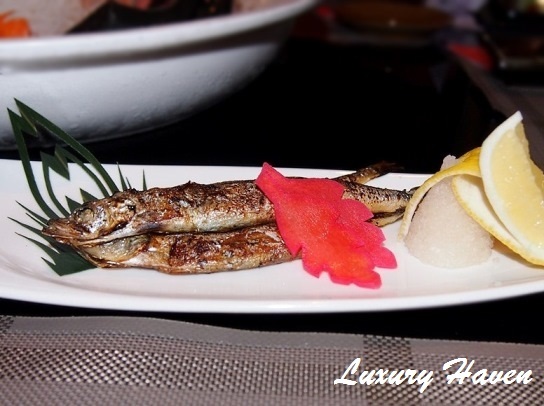 The restaurant’s specialty is Yakimono (焼き物), a charcoal-grilled dish that comes highly-recommended. 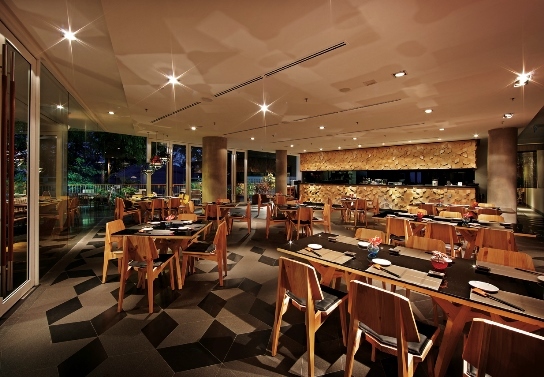 So the next time you’re at Batu Ferringhi, swap your daily local fare & treat yourself to a decent Japanese meal at Matsu! Thank you Matsu, for hosting us! With special thanks to Beth for the special arrangement! 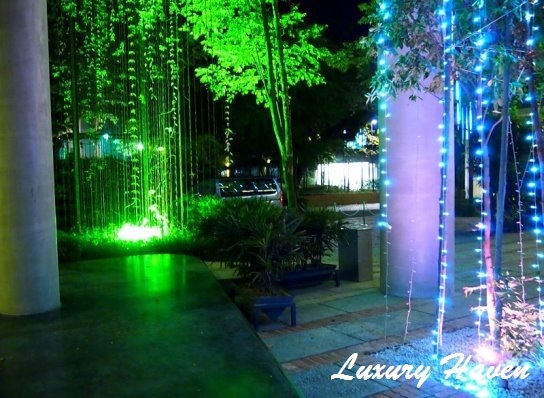 After a satisfying feast, we took a stroll outside Matsu & were greeted by their multi-coloured lights in the surroundings. The lightings put us all in festive mood; I can imagine what Christmas is like spending time at Lone Pine Hotel. Be sure to check out our last day dining at Buffet Breakfast At The Bungalow, Lone Pine Hotel! Uru, thks dear! Hope you'll get the chance when u visit Asia next time. That's really quite a spread to find in Penang! The presentations are definitely awesome. Japanese food - something which i never expect to be able to find in Penang. Eric, glad to have another fan of Japanese cuisine here! I agree with u that Australia's wagyu beef is not as good as the Japanese"s, it just not melt in your mouth! The food at Matsu looks scrumptious! Have a nice break! Veron, so we've another in common! We're both fussy eaters. Hahaha! Shirley you are seriously making my mouth water with this meal! Hamilton, u're simply adorable! Hahaha! I need to make a trip to Nobu too! U take care too, dear! Hi Shirley, the spread look wonderful and their food presentation is so elegant, too good to be eaten. Nice place to dine. Thanks for sharing. Amelia, making u drool eh?? Hahaha! wow nice..is this Matsu restaurant outing sponsored as well? Hong, courtesy of Lone Pine :) You should try this place if u get the chance next time. Food is good!